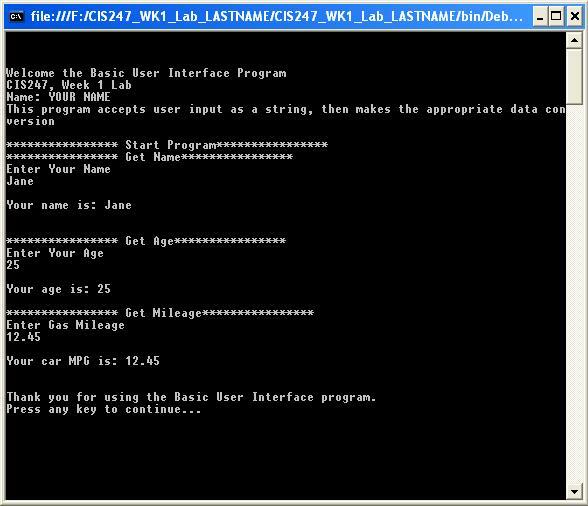 This program creates the basic user interface code that can be used, in the following week’s iLab assignments. The assignment will help you get started using the programming environment and some practice with coding. You will also be able to re-use much, if not all, of the code in later assignments. 1. DisplayApplicationInformation, which will provide the program user some basic information about the program. 2. DisplayDivider, which will provide a meaningful output separator between different sections of the program output. 3. GetInput, which is a generalized function that will prompt the user for a specific type of information, then return the string representation of the user input. 4. TerminateApplication, which provides a program termination message. Also, note that the program should contain a well document program header. •	If you are using the Citrix remote lab, follow the login instructions located in the iLab tab in Course Home. •	Locate the Visual Studio 2010 icon and launch the program. 3. Once the methods are constructed, use the Week 1 Lab Design document to create the Main method. •	When done, compile your code by clicking on Build->Build Solution. Then debug any errors until your code is error-free. If you click on the error in the Error Window, it takes you to the statement in your code, which produced the error. You can then click on F1, which launches the Microsoft Help Library, to see additional information and possible suggestions on how to fix your error. •	To execute your code, click Start and then Start Debugging. Check your output to ensure that you have the desired output. If you need to fix anything, close your execution window, modify your code as necessary, and rebuild. •	Create a test plan in order to make sure your application runs properly. A test plan is a series of tests you choose to perform, where you predefine the input values and write down the expected output. When you execute your code given the input values, your program should display the expected output. If it does not, this means you need to review your code and correct any mistakes. Creating several scenarios, based on the program complexity, ensures that your code runs properly. •	Execute your code and check your output to ensure that you have the desired output. If you need to fix anything, close your execution window, modify your code as necessary, and rebuild. Thank you so much for the help that yall are providing. This has really brought joy to my life cause I was getting frustrated. You are welcome. We are glad the stuff is helping you out.